"I swear, there is no such thing as mystery because there is a reason for everything but for me, those horse-symbolism are mysterious still being unable to investigate the real meaning of it." The province of Abra, well known to be off the track for tourists and travelers because of negative publicity, I bravely entered the province with a motorcycle (actually the scooter type). It took me half a day (from afternoon to dark) to motorbike-traverse several towns along the Abra-Kalinga Road, Ilocos Sur-Abra Road and some off-roads as well and it brought me into the realization that Abra is a very beautiful province, full of natural wonders, even man-made wonders and unknown heritage unwritten in history books that you will come to reverse the idea that this province is infested with dark politics behind the dark entrance. I don't live in Abra but it is close to my heart. Sometimes I even hesitate to blog about the beautiful spots in the province because I am afraid that it will gain attention and eventually become unsustained thus ending up as a trash seconday to irresponsible human activity. I want the beauty to be maintained. Many are not aware that some places in Abra are better than the places known for tourists, some waterfalls are lovelier than any other famous ones, there are beautiful people and tribes with well-practiced cool traditions and culture more exciting than the touristy tribes tourists are seeing. With my younger brother, we drove to the highlands. I don't know if I should be totally excited or nervous but I can not deny the fact that I was more than excited. The zigzag road we were traversing gave us instant relief. Those green mountains were just sweet. Not that I tasted them but it captures my heart to love them more the sweetest way possible. We can hear waterfalls rushing from them afar but there is no way we can get drenched because reaching it will require us to spend more hours and besides we do not know how can we reach that because it is located at the next mountain. 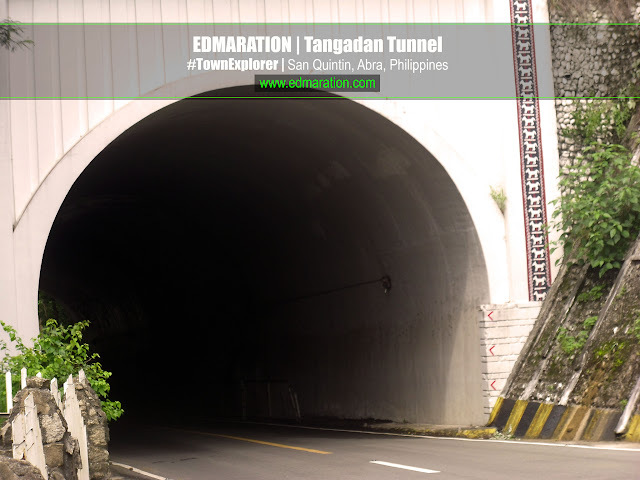 Then we are approaching the Tangadan Tunnel which signifies we are already approaching the province of Abra. There is no comprehensive information I can give about the Tangadan Tunnel because the history about it is not well-documented. For my recent trips to Abra, it has been a dream to photograph this tunnel the way I want it but always ends up to nothing because I usually ride on a bus. The idea of driving a motorbike (though a bit unsafe based on a general perception) to Abra popped out to my mind so that I can stop over anytime. 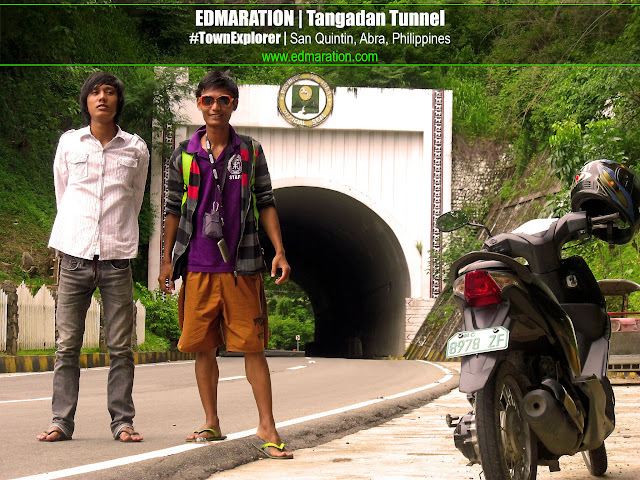 This tunnel is almost synonymous to Abra. 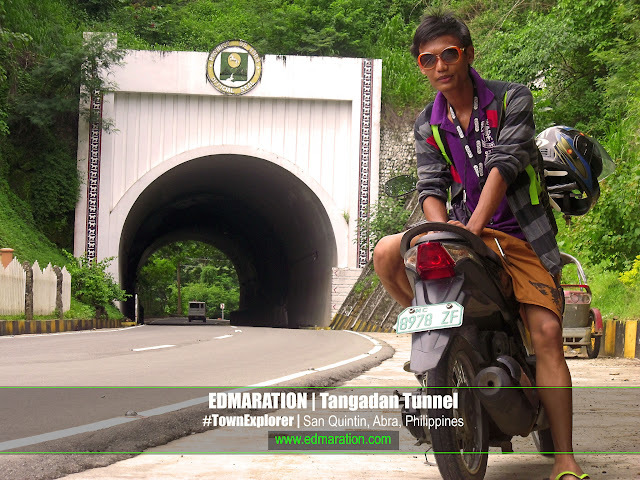 To reach this tunnel, you have to start your road trip from the Narvacan Junction in Narvacan, Ilocos Sur that will lead you to an ascending 9-kilometer road until you reach this tunnel. Near the tunnel is a military camp and a park dedicated to Gabriela Silang, an Ilocano heroine. 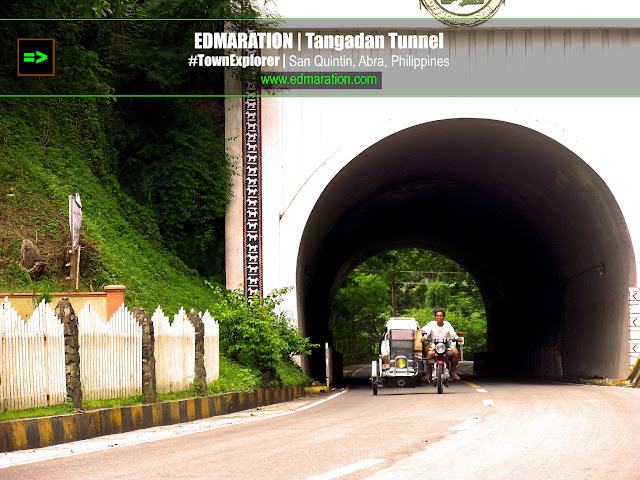 Few is known about the history of Tangadan Tunnel. 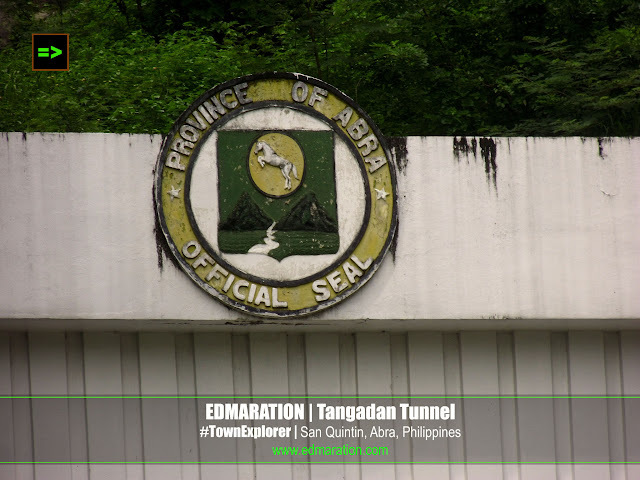 In fact, I have contacted some people in Abra via a facebook group of Abrenians if they can share their knowledge about this tunnel but as of this writing, no information were given yet (I will update this post whenever I receive information from the people of Abra themselves). 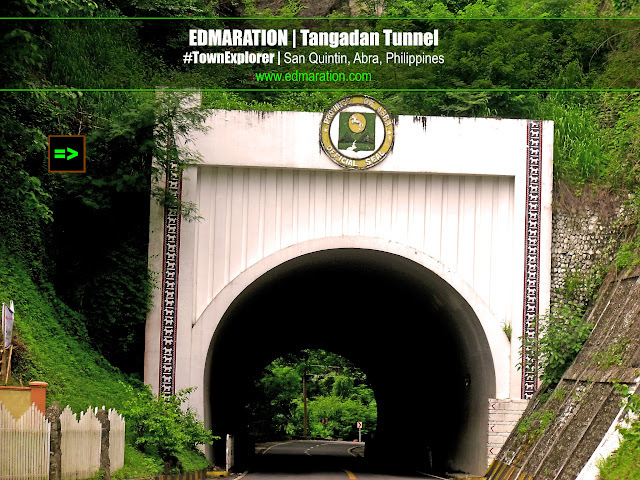 Tangadan Tunnel is also known locally as "Usok" located in Brgy. Tangadan in the town of San Quintin. It has a length of 62.5 meters. If you try to notice the provincial seal, there is a horse symbolism and at the side of the tunnel, there is a row of horses too. Near the tunnel is a horse monument where Gabriela Silang is riding. It is my hypothesis that the horses used in Vigan for calesas during the colonial period may have came from here, though right now, I can say that there are more horses in Vigan now than in Abra (needs citation please, it is only based on my personal observation). The only written history (though based on a verbal account as told by an elder living in Brgy. Tangadan) I can possibly use as reliable is from a souvenir book from IRAA meet in 1981. IRAA stands for Ilocos Regional Athletic Meet. Those times, Abra was still a part of the Ilocos Region (Region 1) and the IRAA meet was held in this province. Abra is now a part of CAR (Cordillera Administrative Region) although most of its people have closer attachment to the Ilocano culture that emanates from Ilocos. 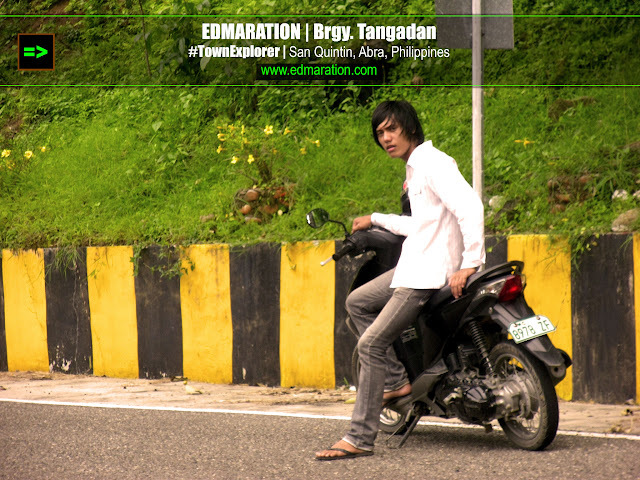 Most of the Abrenians consider themselves as Ilocanos and they speak Ilocano too. 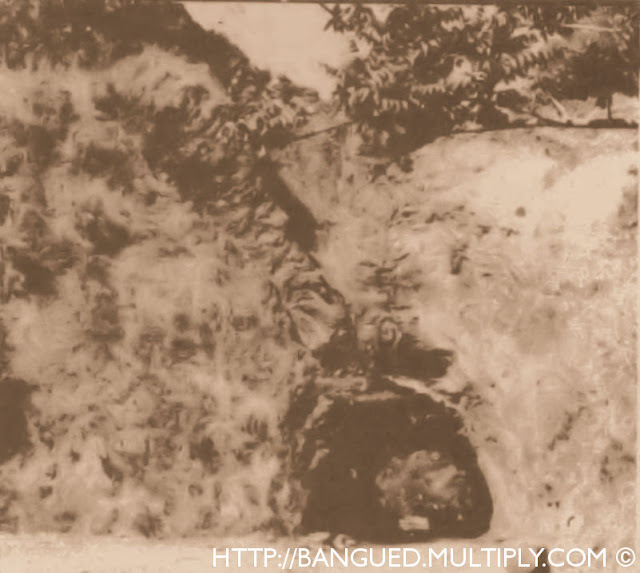 [Photo above: Old Picture of Tangadan Tunnel, Credits to Bangued Multiply Page] According to that souvenir book, based from the memoir of an elderly living near Tangadan Tunnel named Benito Perlas, it is more than just a welcome tunnel. It is a symbol of the Abrenians' resistance against oppressors, resilience from invasion and defiance against odds. The construction of the tunnel started in 1934, an imperative need to divert the old road which was very steep and difficult to negotiate... More than fifty workers labored for two years, hammering, drilling and blasting their way through solid rocks... The resulting structure was a crude one. The walls were not reinforced so that loose rocks fell when rains came. The Allied Forces tried to destroy the tunnel twice to impede the advancing Japanese soldiers. However, it did not totally collapse. 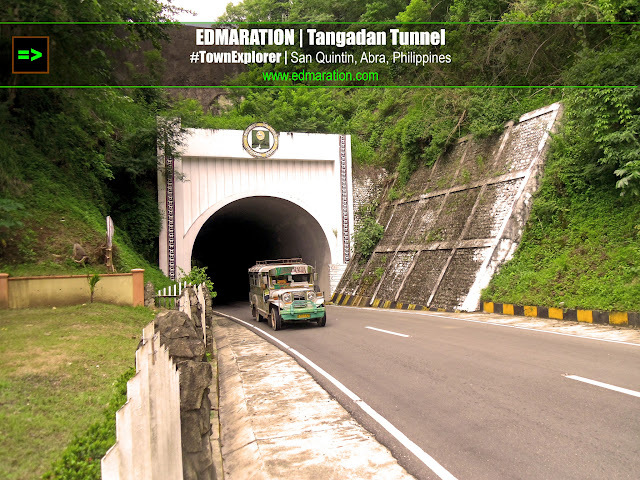 It was only in 1961 that restoration works started, a feat accomplished through the efforts of former congressman Lucas Paredes who worked for the appropriation of over P200,000.00 for the tunnel's reconstruction and improvement. That is a written account about the history of the Tunnel. I believe there is reason for everything. I do not know who crafted the horse-symbolism at the Abra Provincial Seal and I don't have an idea about that. I swear, there is no such thing as mystery because there is a reason for everything but for me, those horse-symbolism are mysterious still being unable to investigate the real meaning of it. If you have noticed some of the photos above, 2 rows of horse-images are also placed at the sides of the tunnel and why horse? It puzzles me that created an urge to investigate and research about it. Nah! Google was not helpful and I ended up contacting several people in Abra to share their knowledge about it but everything turned out to be theories and they didn't consider their statements as facts per se. Here are some of the theories (Even people from Abra themselves are not well-knowledgable about it). 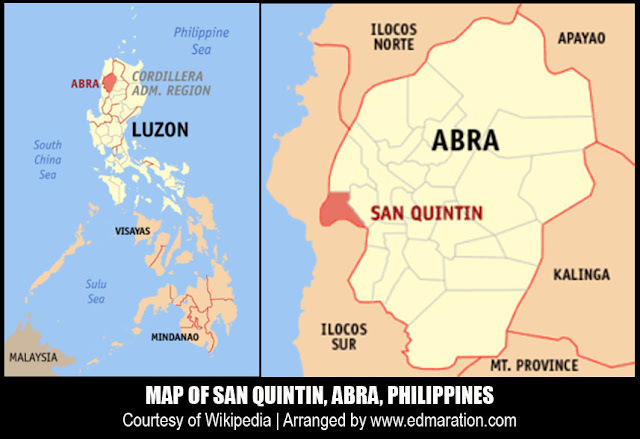 Theory 1 | Abra as Horse Capital of the Philippines: One of them told me that Abra used to be the "Horse Capital of the Philippines" and those horses were good for races. Theory 2 | Horses used to freely roam around Abra: A statement from another Abrenian shows that Abra used to be the land of the free for horses, quoted: "According to my late grandfather, large horses were grazing and roaming free in Abra during his childhood. One would simply catch a wild horse to tame or domesticate and it is his to keep. My grandpa had sold 30 of his tamed horses in the 1930's to accummulate enough money to fund his journey to the mainland USA in 1930. The horse variety pre-dated the arrival of the Spaniards, so it was surmised that they were not Spanish, Mexican, nor Portuguese horses as many believed but rather brought to our land by the Chinese pirates led by Lim Ah Hong giving the theory that the Abra horses belonged to the same horse variety used by the Mongols to establish the biggest empire in history. Horses coming from Abra were the champions in horse races held in Manila during the Spanish era." If you have related theories, you can simply post it at the comment section below. For now, the theories I posted are those I received when I contacted this people. I told you! There are more to know about the mystical province of Abra and all the things you need to know are always hidden from the shadow of negative publicity, over-politicizing and media-hyped violence. 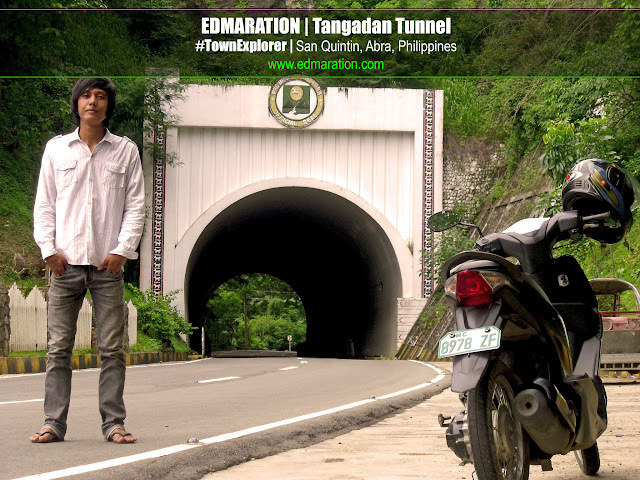 If you are a fan of Philippine Commercials, you can possibly remember the Coca Cola commercial "Karl Kalabaw" which was shot near this tunnel. I tried to find a YouTube video about that commercial but to no avail. If you are so much into the "image" of Abra, you might find it hard to appreciate the province. I am telling you that Abra has many hidden gems unknown to many which remains unknown because the present 'image' has preserved those places giving visitors the fear to explore. 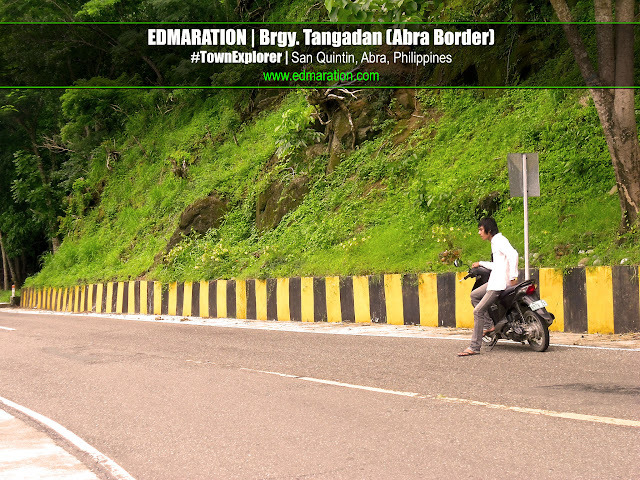 I remember our conversation the other night about Abra, Apayao and the rest :) I dunno, but since I was a kid, laging ang tingin ko sa Abra is 'land of the brave people'. I cannot exactly pinpoint if I read it in a history book or if in a way, I admired a hero from Abra. I still want to go there and appreciate its beauty. I have a feeling na marami pang undiscovered spots dyan. Let me know agad once you know na history of that monument :) Wala bang nakasulat na anuman like kung sino yung nakasakay? Horse is also a symbol of strength. Micamyx|Senyorita | For the next post Mica, I am currently researching it again. Too bad these places aren't documented well, let alone markers that describe the spot. Once I have enough words to say about it, I will publish it ASAP. Indeed, Abra is the land of the brave. Huwag kang tigasin dito dahil sigurado mapupuruhan ka, LOL! Cris | Pinay Thrillseeker | Whoa! I'll explain next why I had goosebumps, alam mo naman ako, exxag kung maka-react, lol! Traveling Morion/Jeffrey rilles | Salamat bro, hehe. Karl Kalabaw!haha Sa Bangued pa lang ako nakakapunta bro!Sana naman mawala na yang magulong pulitika sa Abra! I just stumbled upon this post of yours.. really, you've been going beautiful places that many people don't really know. The feeling must very ecstatic. By the way, a biker advice: It is best not to wear slippers but at least a convenient sneaker that can protect your feet from any possible crashes. Drive safe! dimaks | The Urban Walker | Hey dimaks! Thanks! awww! Yeah, thanks for your advice. I usually use shoes talaga, long pants and other protective gear, it just so happened that one of our destination this day can make us wet! hahaha. We crossed a river and all that so I said, I don't want to go home with a wet shoes and jeans that's why I dared drive with slippers and shorts and an extra baggage for wet suite is an extra burden kasi. hahaha! Wasnt able to find the commercial also. I thought it was Royal's, Coke pala. zanne | Ow wow. Nice to hear that from you, I appreciate it! That's also the mystery am trying to comprehend and solve my friend. I remember when i was still a kid (around 7-8) and living in a remote barrio(7 family-inhabitants, i think) of Lagangilang called Langbao. 'Amma' my maternal-adoptee grandfather used to ride quite-a-large horse whenever he went to town or to visit relatives and acquaintances, and according to him; he had a relative in Lagben(another barrio) who had a mighty horse they called then 'binto-angin' meaning, faster than the wind and i believed him because i was also a horse-rider when i was a kid. CondeBravo | Great to hear from you! I appreciate the stories you shared, wonderful!